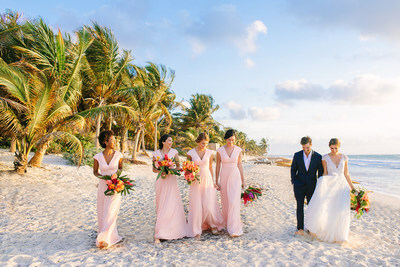 NEW YORK, April 16, 2019 /PRNewswire/ -- Calling all barefoot brides in white sand dresses to Tulum, Mexico---Kleinfeld, the leading designer-bridal retailer, just released a new editorial campaign which highlights popular destination wedding location, Tulum, Mexico. The new content is a series of digital assets which promotes the newest trends in designer wedding dresses while highlighting luxury destination wedding locations with leaders in the wedding business. Who says you can't wear a long train in the sand? We recommend you make a quick stop in-town for this "shot"
This campaign is the newest addition to their portfolio of creative assets which will be released thru one of the most influential wedding dress resources @kleinfeldbridal and www.kleinfeldbridal.com. 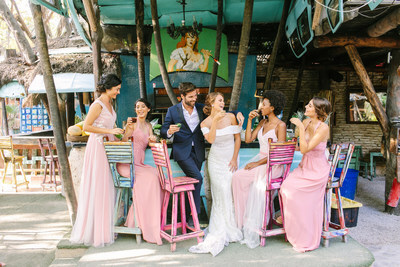 The goal of the shoot was to engage with leading destination professionals to create unique wedding content showcasing the latest wedding dress trends and newest bridesmaid dresses fit for the trending destination of Tulum, Mexico. 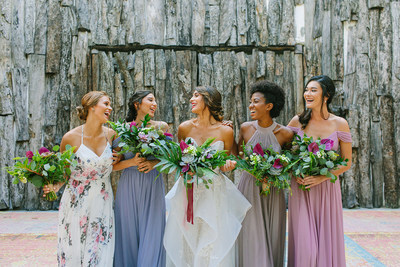 "The previous editorial campaign, photographed in Lonesome Valley, NC, reached over 5 million impressions with engagement exceeding 200k, thru Kleinfeld digital and social engagement making Kleinfeld not only a dress destination, but a wedding influencer," says, Kleinfeld Marketing Director, Jennette Kruszka. "With the importance of social media comes the need for custom content creation. There are not many reputable bridal brands creating exclusive content with reputable planners and photographers creating a full circle benefit for all." 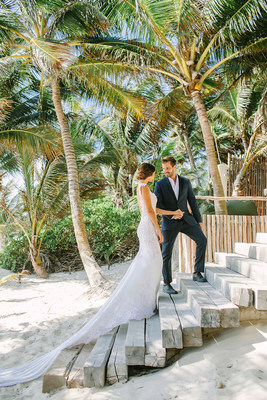 As Destination weddings continue to increase, according to The Knot 2017 Real Weddings Study*, Kleinfeld continues to increase the selection of dresses to fit this category. 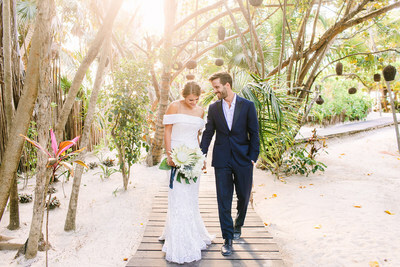 From easy-breezy sheaths to light-weight laces and convertible looks that go from ceremony in the sand to after-party in town, the photography includes the perfect destination dresses from top designers including: Amsale, Jane Hill, Hayley Paige, Maison Signore, Pnina Tornai, Reem Acra, Rivini, Suzanne Harwood, Tony Ward, and bridesmaids from Kleinfeld Bridal Party. 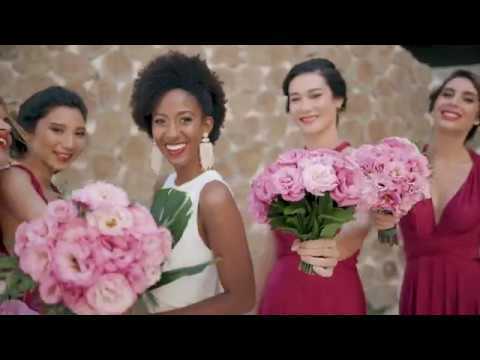 Aimee Monihan of Tropical Occasions, a leader in destination wedding planning, organized and produced the shoot by partnering with Florida based photographer, Jacqui Cole and leading event videographers, La Reve Films. The idea was to create real-wedding scenes which highlight the booming, yet off-the-grid, glamorous but unpretentious, destinations where positive energy flows and dream catchers and hammocks blow in the wind. "Brides-to-be want more than a six-hour party, they want a memorable weekend experience with friends and family," says, event planner, Aimee Monihan. "Tulum, a short flight from the east coast, offers unique amenities and an unforgettable backdrop for photos." 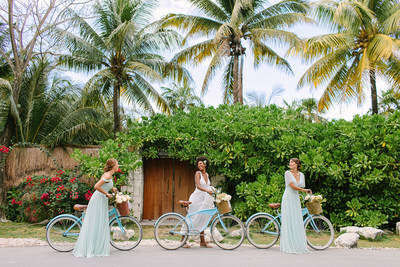 The photography featured wedding parties at popular and luxurious Tulum locations such as, exclusive beachfront villas at Zorba Tulum, the eclectic and luxurious Casa Malca, the romantic Akiin Beach Tulum, as well as in the town of Tulum featuring popular to-do's from visiting the local juice bar, to exploring the town on bicycles, re-hydrating with fresh coconut water and more! All of which make for great photos and memories with your bridal party!